There is an invitation being issued from heaven to those who are pursuing the tangible evidence of God’s Kingdom at work on the earth. The Holy Spirit is exhorting the Church to come up higher, not just in prayer, but in practical application of the principles we hold dear. This invitation especially goes out to leaders who are being called up higher in their role of demonstrating the realities of sonship and Kingdom authority. Through a series of dreams in recent months, the Lord has highlighted several ways in which we as believers can partner with heaven in the fulfillment of God’s plan in this Kingdom Age. His desire is to release the fullness of heaven’s presence, power, and reign to a world walking in darkness. Prayer alone will not accomplish this. It must be accompanied by a tangible demonstration of those prayers in the lives of those who follow Christ (James 2:14). Even as many believers are engaging more in the public square, we are being reminded that any activism within our culture must be birthed out of prayer and intimacy with the Father. Anything less will only have short-term results and have no power to change the future. In one dream, I was shown a pastor who was handed a Death Sentence. However, the picture shown was this pastor lying on his back on his desk with his hands and face lifted towards heaven in worship and prayer. What he died to was the administrative expectations of his ministry and the myriad of details that needed attention. The Lord was urging this leader to place worshiping in Spirit and Truth ABOVE the administration responsibilities that he carried. In the days to come there will be much to administrate. As the Kingdom advances, changes will take place that will require gifts of leadership to guide the Church through the rocky transitions. However, we must not let our preoccupation to details, financial lack, or seeming impossibilities to stop us from moving forward. In the dream, the pastor was dressed in blue, which often illustrates the spirit of wisdom and revelation. As we spend time in His Presence and fix our eyes on Him, we will find heaven’s solutions needed to administrate God’s purposes with a supernatural grace that yields exponential results (2 Cor 4:18). In another dream, I was shown the “birthing” of the Manifested Presence of the Lord. However, this “baby” was still in its water sac and needed to be cut with a sterilized knife in order to breathe on its own. Even though it had technically been delivered, it was not yet ready to survive long-term apart from the cutting of fleshly tissue surrounding it in order for the waters to break forth. Even as many have prophesied this “Revival Baby,” I believe the Lord is exhorting us to allow the Holy Spirit to continue His refining and sanctifying work in us as believers. There can be no lasting move of the Spirit without a Church that has been prepared to host His Presence long-term. This means recognizing heaven’s knife in cutting away things from our lives, both personally and corporately, in order for His Spirit to rule and reign. As we remember what this is UNTO, we can face any cross because of the greater joy that is set before us (Heb 12:2). In this dream I was in a regional gathering where the Holy Spirit broke out through worship. As some of the pastors were beginning to engage with this move and exhort the people, another well-known leader who had a large denominational following, stopped them. He felt it was time to move on. His focus was not on the spontaneous move of the Spirit, but what seemed most familiar, safe, and controllable. Though many have spoken of Religious Spirits and demonic attempts to control believers, I felt the purpose of this dream went beyond simply recognizing the interference. What was needed was one of these pastors to take a stand for what the Spirit was doing. The fact was, there was more than one pastor who recognized this heavenly move. Had these pastors agreed together and spoken out, I believe this traditionally-minded leader would have had to yield. We need increased courage to take a stand for what we know is of God and we need to do it together. Prayer alone will not stop demonic systems. We must DISPLACE those influences by courageously speaking up and engaging with heaven. God will back us up if we back Him up (Luke 12:8). The Lord highlighted some of these truths again through another dream. It was shown that the Church had unknowingly gotten into a covenant with MINISTRY instead of HIM (“married to ministry”). There was an awakening that was happening to this reality, but a concern of how to make things right. Realizing that we had given our hearts to something else, we were now caught and looking for help to get back to our First Love. As prophetic voices and apostolic leaders continue to emerge, the Lord is reminding us of Who it is that calls us and empower us. Our heart posture, mental preoccupation, and daily priorities must reflect a heart that is in covenant and agreement with HIM first, above and beyond any ministry. Even “good things” can keep us back from the best things. As ministries and followings grow, let us remember to keep our Lover first and foremost in our hearts and decisions in order to reap the fruit that can only come through our covenantal bond with Yahweh. We cannot allow any ministry to outgrow our love for Him nor give our hearts to lesser things (Matt 6:19-21). One of the alignments that intercessors have been praying about is between generations. This current generation is a mercy-centered generation. The cry to love and accept others, and the passion for social justice comes from this heart to help and serve others. However, in many cases, righteousness and holiness often take a back seat. Then there is the previous generation who were taught to stand on godly principles and the truth. We hold a deep conviction for walking in truth at all costs, even if it means sacrificing relationships. Both Mercy and Truth are characteristics of God’s heart and purpose. However, we must bridge this gap, not only between generations, but between mindsets. Even our current political parties represent some of these differences. It will require a deeper understanding of the larger picture of God’s heart in order to bring these two values together. There can be no true mercy apart from the righteousness of God. And, there can be no truth apart from God’s unconditional love (1 Cor 13:6, Eph 4:15). If we are to see cultural changes and governmental policies change, it will require Mercy and Truth to walk together and bear fruit that only heaven can produce (Ps 85:10). This coming year, we are being invited to partner with heaven through our prayers AND through our demonstration of Kingdom values and character. Talk will only get us so far. Without the Church modeling what the Kingdom looks like, there will be no salt to draw the thirsty or hope to inspire the lost. As we continue to press into interceding for each other and this nation, may we remember to get outside our prayer closets and demonstrate to the world this Glory we so passionately pursue. 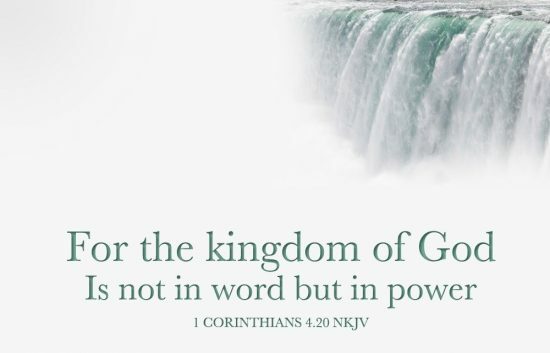 For the kingdom of God does not consist in talk but in power. (1 Cor 4:20 ESV). What a timely word! There is an unprecedented move of God coming and His bride is being made ready inwardly! An internal kingdom with eternal purpose, plans and influence! WOW! Excellent words, Wanda. Really powerful and so glad you articulated all this so clearly. Praying this word will expand and be heard by many more!